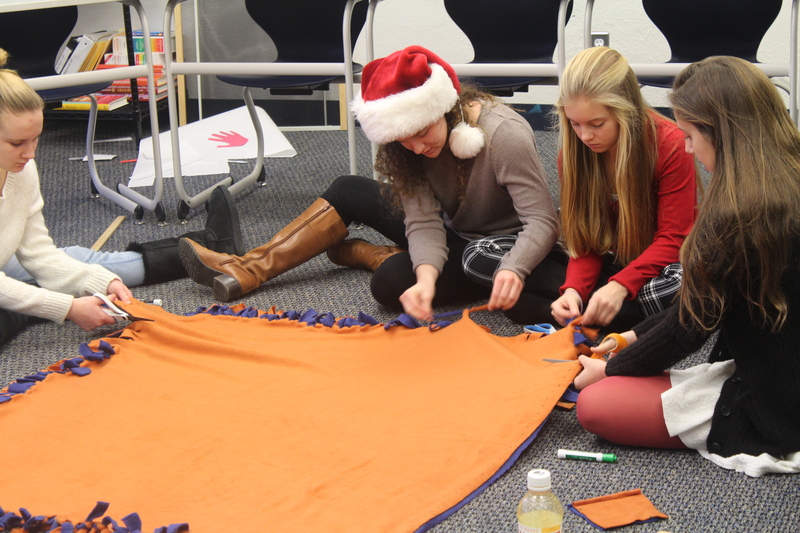 On the last day of school before Christmas break, students make fleece blankets to donate to Project PAUL. Throughout the holiday season, students participated in community service activities including making gift bags, collecting food for Thanksgiving dinners, making fleece blankets and much more. The goal of the service projects is to brighten the holidays for the people in need in the community. Prior to Thanksgiving, about 10 students volunteered with Holiday Express to sort items to make gift bags for teenagers and children in a mental rehabilitation center. Items, including bath products and candy, were donated by the community to Holiday Express, an organization that helps a variety of people in need, from children to the disabled to the elderly. “I think it is important that I help others who aren’t as fortunate as [I am] over the holidays because everyone deserves a happy holiday,” sophomore Reilly Burns Cohen said of her reason for joining the Holiday Express project. Students also collected food within their advisories to make eight complete Thanksgiving dinners for Project PAUL, which provides services for the Poor, Alienated, Unemployed and Lonely in the Bayshore area of Monmouth County. Prior to Christmas break, students also made fleece blankets to donate to Project PAUL as well. 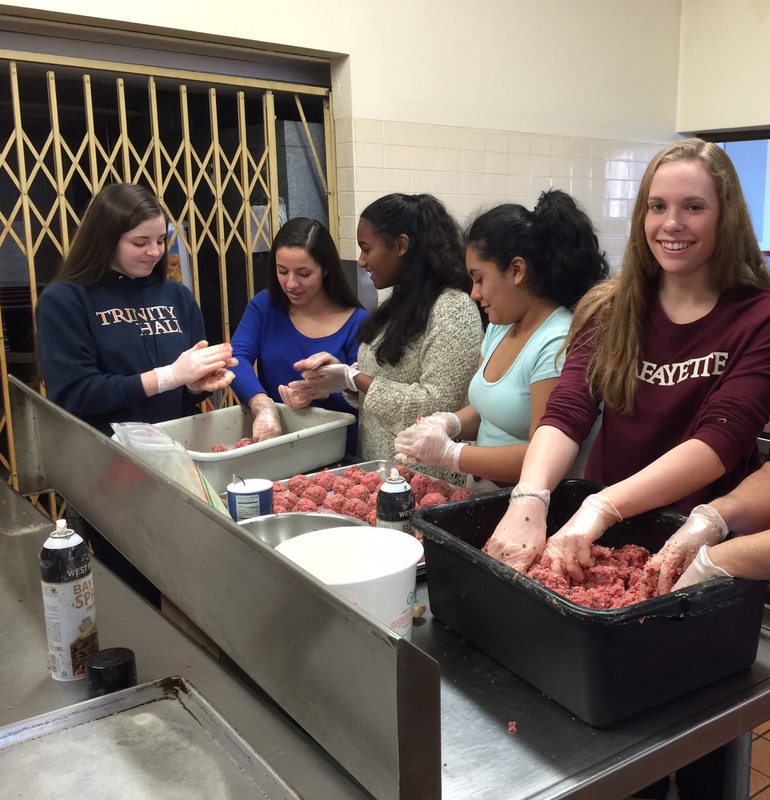 Students from the SADD club prepare food for the CBA SADD Dinner for the Troops on Dec. 9. “I knew Project PAUL was in desperate need of food. They serve over 100 families each Thanksgiving, and I think it’s important for us to always share from our bounty with others,” said Melissa Whelan, advisor of the Service Club. As a part of Operation Sleigh Bells, the service club set up a “giving tree” that allowed students and faculty to purchase a Christmas gift for a needy child in the local community. “We knew 100 percent of our community would participate in Operation Sleigh Bells, so we were confident we could provide all of the gifts requested by the children,” said Lily Scott, co-founder of the Service Club. Another holiday service opportunity was provided by the SADD (Students Against Destructive Decisions) club, which participated in the CBA SADD Dinner for the Troops at Christian Brothers Academy on December 9. Trinity Hall students helped prepare and serve the dinner. All of the proceeds from the dinner are used to buy calling cards so soldiers can call home at Christmas and other supplies for the troops. “Overall I think that both the Trinity Hall girls and the CBA boys communicated well to get their jobs done, and through listening to the guest speakers, we all got something positive out of the event,” said Alessandra Sanfratello, leader of the SADD Club.